While this weekend’s Batman v Superman: Dawn of Justice will introduce both Batman and Wonder Woman to the DC cinematic universe, it will also be the coming out party for a handful of other heroes. One of those making his big screen debut will be Aquaman, as played by Jason Momoa. While the lord of the deep is often overlooked by comic fans, and has a general reputation of being one of the lesser impressive heroes, DC’s Chief Creative Officer Geoff Johns thinks the people who underestimate Aquaman are in for a shock on the big screen. In addition to being in charge of DC’s greater creative vision, Geoff Johns was also one of the writers responsible for the most recent reboot of Aquaman in the comics. They took the old jokes about Aquaman being a hero who was useless outside of the oceans and turned them on their head. Now, he tells Comicbookmovie.com, that he loves a good joke as much as the next guy, but the Aquaman we’re going to get in theaters is not one. It’s massive [seeing Aquaman on the big screen]. Jason [Momoa] and I were talking about Aquaman, and I love that people underestimate the character. I feel like hopefully we’ll be able to share the love that we have as readers of the character because the jokes about him are fun, but he’s got so much depth to him, no pun intended. It’s really great to see him finally on the big screen. With Aquaman being played by Game of Thrones star Jason Momoa, they’ve certainly cast somebody who is going to make the character look tougher than people are used to seeing him. It’s possible that DC is expecting fans to discount the character and they’re actually going to use that to their advantage. We know that in addition to properly meeting Aquaman in Justice League: Part One we’ll also be meeting his queen, Mera, which implies that their undersea kingdom, or, at least, the people who reside there will be an important part of the first big team up movie. While Aquaman’s name is often one of those alongside names like Superman, the Flash, and Green Lantern in the Justice League, the guy has never received the credit that the others have. Traditionally, Aquaman’s powers have been limited to interacting with sea life and other water based abilities, which has made the character seem less than useful under any other circumstances. Also, his traditional look was a little silly. He's a popular punchline. 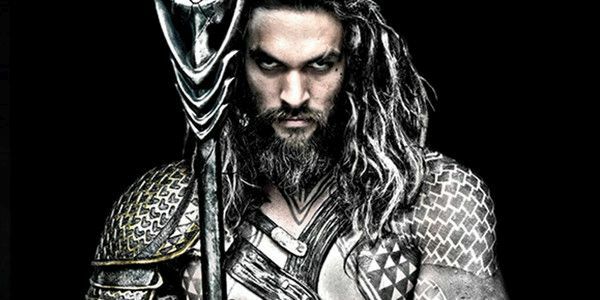 Jason Momoa certainly doesn’t look like the old school Aquaman, so we expect he’ll act a bit different too. Where does Aquaman rank on your Justice League list? Are you excited to see the new character, or do you still think he’ll turn out to be a joke?